Fortunately both of theses things are eminently doable. UDP multicasting we get for free courtesy of the class java.net.MulticastSocket. 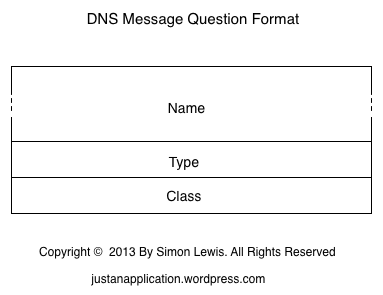 The class MessageReader is responsible for reading incoming DNS messages. Only responses are handled as that is all we expect to see. 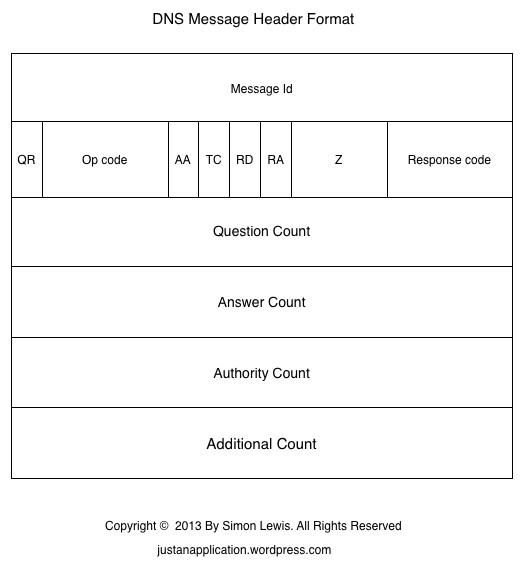 The components of the response are handed to an instance of ResponseHandler as they are read. These are the methods that read the message. To do DNS base service discovery we need the ability to make queries and see the responses. which can be used to make queries. The FindServices class uses the ‘API’ to find services of a given type. All the examples involve combinations of three hosts on a wifi network. An Android device and a actual printer. D/FindServices( 2549): ANSWER PTR: Canon MG6200 series._ipp._tcp.local. D/FindServices( 2549): ANSWER SRV: Canon MG6200 series._ipp._tcp.local. D/FindServices( 2549): target   == 7D300C000000.local. D/FindServices( 2549): ANSWER TXT: Canon MG6200 series._ipp._tcp.local. D/FindServices( 2549): key == adminurl value == http://7D300C000000.local. D/FindServices( 2549): Found service Canon MG6200 series._ipp._tcp.local. An Android device and a Mac. The Mac is running an instance of the CUPS 1.7.0 test server ippserver with the name ipp_server_1 is which listening on port 6363. The MacOS X mDNS implementation, mDNSResponder, is following the recommendation in RFC 6763 and is returning the relevant SRV and TXT records as well as the AAAA and A records as additional records in the response to the original query. D/FindServices( 2815): ANSWER PTR: ipp_server_1._ipp._tcp.local. D/FindServices( 2815): ADDITIONAL SRV: ipp_server_1._ipp._tcp.local. D/FindServices( 2815): target   == Simons-Computer.local. D/FindServices( 2815): ADDITIONAL TXT: ipp_server_1._ipp._tcp.local. D/FindServices( 2815): ADDITIONAL AAAA: Simons-Computer.local. D/FindServices( 2815): ADDITIONAL A: Simons-Computer.local. D/FindServices( 2815): Found service ipp_server_1._ipp._tcp.local. The Mac is running two instances of ippserver. As in Example Two all the necessary information is contained in the reply to the original query. D/FindServices( 2929): ANSWER PTR: ipp_server_1._ipp._tcp.local. D/FindServices( 2929): ANSWER PTR: ipp_server_2._ipp._tcp.local. D/FindServices( 2929): ADDITIONAL SRV: ipp_server_1._ipp._tcp.local. D/FindServices( 2929): target   == Simons-Computer.local. D/FindServices( 2929): ADDITIONAL TXT: ipp_server_1._ipp._tcp.local. D/FindServices( 2929): ADDITIONAL SRV: ipp_server_2._ipp._tcp.local. D/FindServices( 2929): ADDITIONAL TXT: ipp_server_2._ipp._tcp.local. D/FindServices( 2929): ADDITIONAL AAAA: Simons-Computer.local. D/FindServices( 2929): ADDITIONAL A: Simons-Computer.local. D/FindServices( 2929): Found service ipp_server_2._ipp._tcp.local. D/FindServices( 2929): Found service ipp_server_1._ipp._tcp.local. An Android device, a printer and a Mac running an instance of ippserver. Just to show it can be done. D/FindServices( 3453): ANSWER PTR: ipp_server_1._ipp._tcp.local. D/FindServices( 3453): ADDITIONAL SRV: ipp_server_1._ipp._tcp.local. D/FindServices( 3453): target   == Simons-Computer.local. D/FindServices( 3453): ADDITIONAL TXT: ipp_server_1._ipp._tcp.local. D/FindServices( 3453): ADDITIONAL AAAA: Simons-Computer.local. D/FindServices( 3453): ADDITIONAL A: Simons-Computer.local. D/FindServices( 3453): Found service ipp_server_1._ipp._tcp.local. D/FindServices( 3453): ANSWER PTR: Canon MG6200 series._ipp._tcp.local. D/FindServices( 3453): ANSWER SRV: Canon MG6200 series._ipp._tcp.local. D/FindServices( 3453): target   == 7D300C000000.local. D/FindServices( 3453): ANSWER TXT: Canon MG6200 series._ipp._tcp.local. D/FindServices( 3453): key == adminurl value == http://7D300C000000.local. D/FindServices( 3453): Found service Canon MG6200 series._ipp._tcp.local. immediately beneath the root ot the DNS name space. The DNS name space sub-tree beneath the local node is not global but confined to the hosts directly attached to a given network. There is no dedicated DNS server responsible for managing a local sub-tree. Instead individual hosts attached to a network can each allocate nodes within the local sub-tree themselves. This means that different hosts can allocate nodes with the same name with associated resource records of the same type and class. For queries to work in this context they are sent via multicast UDP so that they can be seen by all the hosts in the local network which may have allocated nodes in the sub-tree. Queries may result in multiple responses each from a different host. RFC 6763 DNS-Based Service Discovery specifies how the DNS name space and DNS resource records can be used to make services discoverable. The label of a node which represents a service type starts with an underscore (‘_’). which, curiously, does not necessarily mean that the service is available via UDP, although it can be, but that the service is available via some protocol other than TCP. A service type node has an associated PTR record for each service instance of that service type. The data in each PTR record is the name of the node representing the service instance. A service instance node has an associated SRV record. 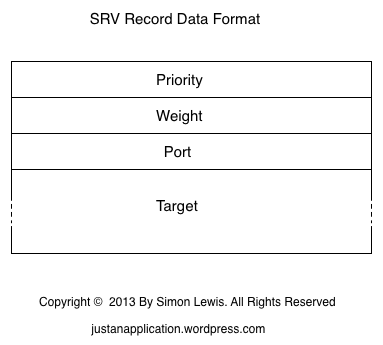 The SRV record data identifies the host on which the service instance is running and the port it is listening on. A service instance node also has an associated TXT record. The key value pairs provide additional information about the service. To discover all the instances of a given service type it is only necessary to query the appropriate service type node for its PTR records. Each PTR record in the answer will identify a service instance. The node for each service instance can then be queried for its SRV and TXT records. The standard recommends that the associated SRV and TXT records of the service instancea be included in the additional records section of the response to the query to the service type node for its PTR records. In theory therefore it is possible to obtain all the information about the available instances of a given service type with a single query, subject to limits on the datagram size. Over simplifying wildly, the Domain Name System (DNS) defines a global tree-structured name space. Each interior node and leaf node in the tree identifies a resource and can have zero or more associated resource records. Each node in the tree has a label. The label of the root node is the empty string so all node names end with a dot (.). Each resource record has a class and a type. A given DNS server maintains a database of all the resource records associated with a particular sub-tree of the entire name space. Clients of the server can issue queries against the server’s database. A query to a DNS server is a request for a set of resource records associated with a given node. The query specifies a node within the DNS name space and the required record class and type. If the specified node has a associated records of the given class and type they are returned in the response to the query. In certain circumstances a DNS server may obtain an answer to a query it receives by performing a recursive query, that is, by itself querying another DNS name server. Queries can be sent using either UDP or TCP. In both cases a DNS server listens on port 53. There are a large number of defined DNS record types. An A record contains an IPv4 address. An AAAA record contains an IPv6 address. A PTR record contains the name of a node in the DNS name space. A SRV record contains information about a server. A TXT record contains arbitrary text. Queries to a DNS server and responses from it use a single message format. A sequence of zero or more Questions. 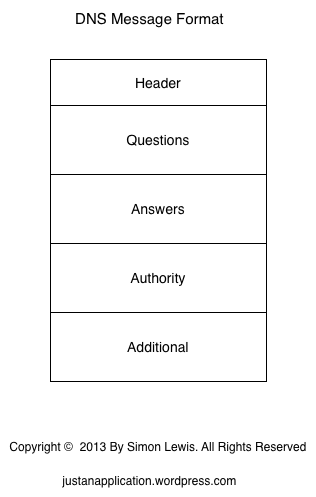 If the message is a query than this section contains the question expressing the query. If the message is a response than this section contains the question sent in the query to which this is the response. A sequence of zero or more resource records. If the message is a non-error response then this section contains the resource record(s) which match the query to which this is the response. If the message is an error response then this section may contain resource record(s) identifying DNS servers which can be queried instead. If the message is a non-error response then this section may contain resource records, which do not match the query, but are related to it, e.g., other resource records for the same node. If the message is a query then this is the id of the query allocated by the entity performing the query. If the message is a response then this is the id of the query to which this is the response. 0 if the message contains a query. 1 if the message contains a response. Only valid in a response. If set then this message was truncated. If set in a query then the server is requested to perform a recursive query if necessary. If set in the query it will also bet set in the response. If set then the server is capable of performing recursive queries. 0 if no error occurred. The number of questions in the questions section of this message. The number of resource records in the answers section of this message. The number of resource records in the authority section of this message. The number of resource records in the additional section of this message. The name of the node whose resource records are being requested. The type of the requested resource record(s). The class of the requested resource record(s). The encoded name of the node to which this resource record applies. The type of this resource record. The class of this resource record. The number of seconds after which this record is no longer valid. A 16-bit unsigned integer field. The length in bytes of the data that follows. Although there are a number of DNS classes defined the class of a resource record is usually IN (Internet) which has the value 1. Resource record types are specified using 16-bit integers. In the basic encosing a node name is encoded as a sequence of labels. Each label is encoded as a byte field specifying the length of the label followed by the bytes encoding the label. Since the root label is the empty string an node name encoded in this way is always terminated by a zero byte. Alternatively all of a node name or the suffix of a node name can be encoded as a reference to all or the suffix of a previous node name in the message. If the top two bits of the byte encoding the label length are set then the other 6-bits of the byte and the 8-bits of following byte specify the offset in the message of the ‘rest’ of the node name. A 32-bit IPv4 address in network byte order. A 128-bit IPV6 address in network byte order. A 16-bit unsigned int in network byte order. Intended to be used by a client to choose between servers. The client should attempt to use the server with the lowest priority. A 16-bit unsigned int network byte order. Intended to be used by a client to choose between servers of the same priority. The client should attempt to use the server with the highest weight. The port on which the server is listening. The encoded name of the node which represents the host on which the server is running. 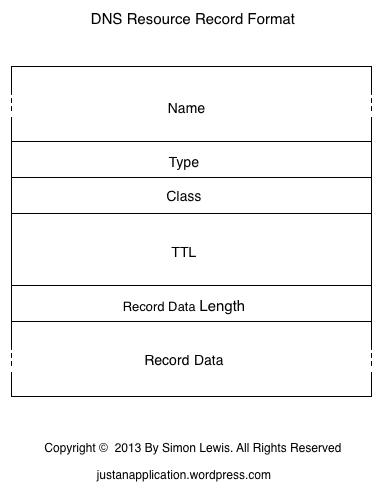 The format of the data of a TXT record is context specific.